Hi friends! Today I’m sharing some great gift ideas for the farmhouse lover in your life. Many of these items are things I own and love myself, like my Magnolia Home Crate and vintage mailbox, but I’ve also found a few others things that are sure to make any farmhouse loving lady happy. Or maybe even a little gift for yourself? I’m sure you deserve it! Loves Grows Best in Little Houses Sign–I have one of these signs in our dining room and I get compliments on it all the time. This would make an amazing gift! Antique Key Necklace–I have a necklace like this and it’s easily my favorite. Perfect for anyone that isn’t into flashy jewelry, but favors more of a vintage feel. 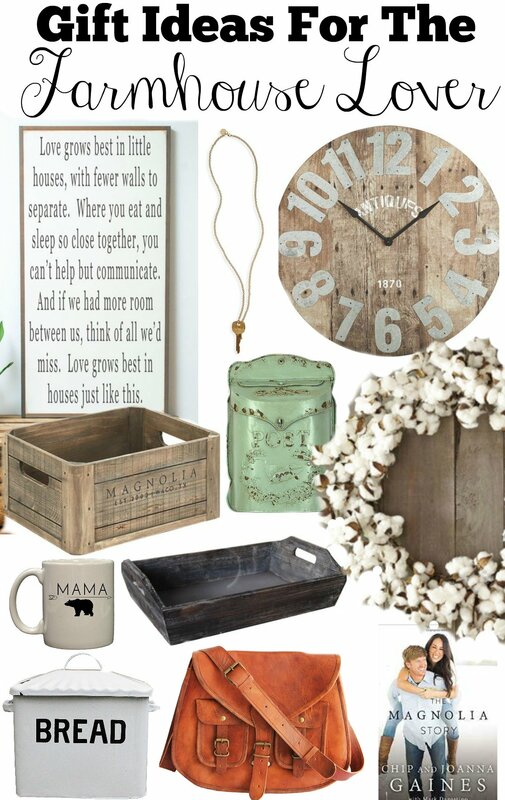 Magnolia Home Wooden Crate–This crate is the bomb. I have one and I used it all over the house. Seriously, there are so many different ways to use it–I even wrote a whole post about it. Shabby Wood Tray–You really cannot go wrong with a classic wooden tray. Again, this can be used in a ton of different ways. This would be perfect on a coffee table with a few old books and a candle, or maybe even your dining table with fresh flowers. Oversized Aged Rustic Wall Clock–If you want to make someone really, really happy, just get them this rustic large clock. I mean, you’ll probably be their favorite person after a gift like that. Vintage Tin Mailbox–Any vintage lover in your life would be thrilled to get this tin mailbox. This is another piece that could be used in a ton of different ways. I bought one for myself and I LOVE it. Check it out in this post. Cotton Wreath–A classic, farmhouse style wreath like this one can be used for years and years to come. Mama Bear Coffee Mug–How cute is this mug?! There’s even a matching one that says Papa Bear. If you follow me on Instagram you probably already know I have an obsession with coffee mugs, so of course I had to include one. Enameled Metal Bread Box–I have seen this breadbox in sooooo many kitchens on Pinterest. I think it belongs in just about every farmhouse kitchen. Distressed Leather Sling Bag–I’m a bit obsessed with Joanna Gaines’ style and I noticed she is always carrying classic leather bags. I love this one because it’s under $40 and isn’t too big or bulky. The Magnolia Story–I recently finished this book and it was AMAZING. Such a great read for anyone that loves Fixer Upper, but also great for anyone that has big dreams. It was so inspiring!